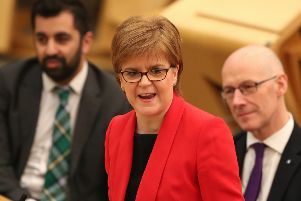 Labour has claimed a Scottish Government pledge to effectively ban electric shock dog collars is an “outright lie” after a minister admitted the use of electronic training aids is “not prohibited”. Earlier this year Environment Secretary Roseanna Cunningham announced the devices would be outlawed following pressure from animal rights groups. Animal rights groups and charities like the Dogs’ Trust argued that the collars, which have been used to train difficult dogs, were cruel and caused unnecessary suffering. At the time, Cunningham said she had taken steps to “effectively and promptly ban their use in Scotland”. Cunningham issued ministerial guidance for courts that would be taken into consideration in cases involving the unnecessary suffering of dogs through electric shock collars. She added: “Anyone found causing pain to dogs through the use of collars or other devices can be prosecuted as they deserve”. But in answer to a parliamentary question tabled by Labour’s Colin Smyth, rural affairs minister Mairi Gougeon suggested that such devices could still be used. Smyth accused the Scottish Government of failing to protect animals and called for a full, legislative ban to be introduced in Scotland. “Electric shock dog collars are inhumane and unnecessary – and should be consigned to the dustbin,” Smyth said. “The SNP’s claim that this guidance would ban their use has been exposed as an outright lie. “Once again they are refusing to take the action needed to protect animals. That is unacceptable. A Scottish Government spokesperson explained that the guidance was “advisory” and made clear that causing unnecessary suffering by using electronic training aids may be an offence under the Animal Health and Welfare (Scotland) Act 2006, depending on the circumstances. The spokesperson said: “The new guidance explains that causing unnecessary suffering through the use of electronic dog collars may be a criminal offence depending on the circumstances. There is a commitment to review the effectiveness of the guidance in 12 months’ time. “The guidance was agreed with the Kennel Club and key animal welfare organisations including Dogs Trust, Scottish SPCA and the British Veterinary Association.